A perfectly clean shot, and this guy nearly ruined it by crouching on the other side of the deer. Finally he moved to the front of it and gave me a safe shot. He was quite obnoxious after he regained consciousness, even though I took out my canteen and offered to help clean the mess off his face. Felony in Oregon ... interfering with a legal hunt. 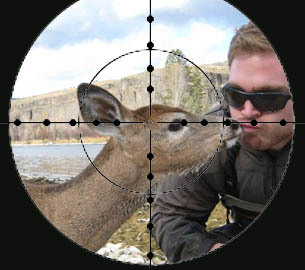 PeTA folks don't harass hunters much around here. "...took out my canteen and offered to help clean..."
Was that before or after the water had filtered through your kidneys? BULLETIN: You can read my constitutional warning to Sarah Palin in re: here keynote speech at the Tea Party Convention at my blog. It really is worth reading. David Hardy, you can delete this little bulletin of mine if you want to but I do have a message to get out and it SUPPORTS YOUR EFFORTS with your blog for the Second Amendmend. A police detective in Palo Alto California has apparently been caught posting a message on his Facebook page making the thinly veiled suggestion that Californians who exercise their Second Amendment rights with Unloaded Open Carry, should be enthusiastically murdered. "Rod Tuason : Sounds like you had someone practicing their 2nd amendment rights last night! Should've pulled the AR out and prone them all out! And if one of them made a furtive movement...2 weeks off!!!"